Clean and sleek, the Dublin High Shelving Unit is a stylish way to get your belongings organized. It's beautifully crafted of honeycomb inlay framed with chipboard and encased in a medium-density fiberboard shell, reducing the weight of the unit but increasing its durability to provide long-lasting strength and use. Each row alternates two different sized compartments, adding to the modern style of this geometric celebration. 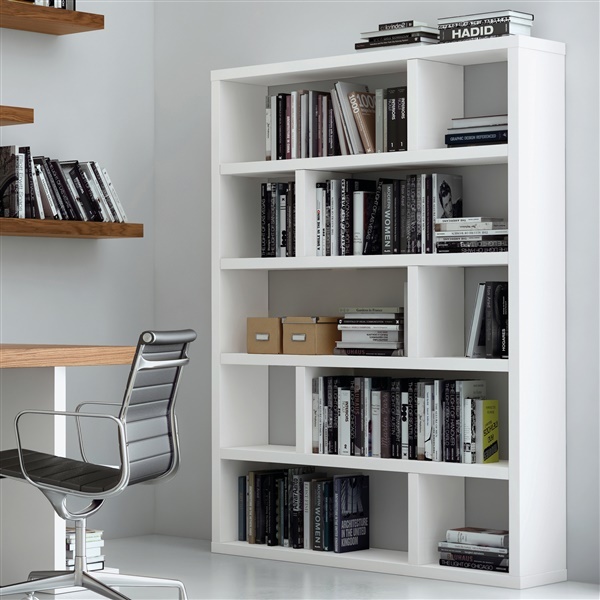 Perfect for any contemporary living space, this shelving unit can function in your living room, office or media room to keep things arranged neatly with a contemporary flair. How much weight do the shelves hold? Can it be used as a bookcase. Filled with books? The Dublin High Shelving Unit can be used as a bookcase filled with books. There is no specified weight limit for each shelf, but the overall weight limit of the entire unit is 198 lbs / 90 Kg.